The Matthews NC real estate market is a treasure trove of affordable houses that will meet all of your needs, whether you want a short job commute or a property with plenty of land for expansion. You’ll also find Matthews NC real estate near quality schools as well as places and recreations where you can unwind on the weekends. In the 1800s, Matthews was a small farming community called Stumptown due to the cotton farmers who had cleared the land and left countless tree stumps in their wake. Later it was Fullwood, named after the area’s first postmaster and operator of Stagecoach Inn. It wasn’t until 1874 that Fullwood became Matthews, in honor of the railroad’s director, Edward Watson Matthews. The town grew rapidly not long after, and by 1901 the community’s downtown area was home to two cotton gins, three general stores, a bank, two doctors, a pharmacy, a blacksmith shop, a stable, and a hotel. The need for Matthews homes for sale grew even more following World War II as it transformed from a farming town into a business magnet with thousands of people. Stay Close to the Outdoors! Matthews is close to five parks worth mentioning – the Baucom, Matthews-Sardis, Squirrel Lake, Stumptown and Windsor Parks. All of these area parks have activities that will appeal to each member of the family. Walking trails are perfect for taking the dog out, enjoying the surrounding nature or sneaking in some casual exercise. Sports fans can play in the fields while the younger ones occupy themselves on nearby playgrounds. Classes and teams are also offered at different centers in the town. The Crews Road Recreation Center has athletics clubs and team events while the Matthews Community Center has both free and paid classes as well as social events. In the summer and fall, Matthews holds festivals and community-wide get-togethers such as Matthews Alive. Best of all, no matter what Matthews NC real estate you buy, you’ll never be too far away. If Matthews isn’t the best fit for your lifestyle, explore Charlotte real estate and homes for sale in Mint Hill, another popular South Charlotte town. 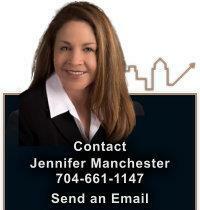 By contacting me, Jennifer Manchester, you can begin looking through the unique Matthews area and find a home perfectly suited for you and your family. All it takes is a few moments of your time, so call or email me today.